I was surprised to learn from my students that many of them are still being taught to write the five-paragraph essay in high school. You know it: an introductory paragraph that begins with a hook and ends in a thesis statement. Three body paragraphs, each with a topic sentence and two or three pieces of supporting evidence or detail. A conclusion that restates the thesis and summarizes the main points. Transitions throughout. My colleagues in education tell me that many schools hang onto the five-paragraph form because they believe it is an effective starting point which bootstraps weaker writers. Some are also convinced it is expected on standardized assessments and in college. Yet as Kimberly Hill Campbell and Kristin Latimer point out in their book Beyond The Five-Paragraph essay, such defenders are engaged in wishful, mythical thinking. The five-paragraph essay, Campbell and Latimer argue, prioritizes a fixed form over cogent thinking, does little to develop a sense of audience, and is counterproductive in terms of standardized testing and college-level writing. The five-paragraph form is a far cry from the essay as originally conceived—by Montaigne—as a witty, thoughtful exploration of ideas. Instead, it flattens a writer’s voice, dulls reasoning, and engenders habits of formulaic exposition that some never shake. The five-paragraph form seems to have arisen from the schoolroom practice of writing themes, as essays were once called, and the idea goes back to Greek and Roman rhetorical exercises called progymnasmata. These formal exercises made their way into later English practice, and John Locke complained about them in Some Thoughts Concerning Education. Instead, it flattens a writer’s voice, dulls reasoning, and engenders habits of formulaic exposition that some never shake. Theme writing emerged in the early twentieth century as the pedagogical norm. Such writing was, as William Coles, Jr., noted in The Plural I, “not meant to be read but corrected.” It was the expository equivalent of the fill-in the blank exercise. Today, the terminology is different—we talk about writing essays or term papers—but the complaint is still valid. Perhaps the five-paragraph essay hangs on because of the constraints of class size or the inertia of tradition. But there are other approaches that encourage more attention to audience and depth of thought (techniques that good teachers gravitate to even if the five-paragraph form is forced upon them). One is to allow time for exploration of topics as a group. Discussion and debate before writing inevitably helps writers to consider a wider range of perspectives and connections. As writers talk about what sort of evidence and examples are most relevant to a point, they will probably leave the five-paragraph form behind. So talk first, write later. The five-paragraph essay, I’m afraid, is all skeleton. Featured image: Writing. Image by StockSnap. CC0 via Pixabay. Edwin L. Battistella teaches linguistics and writing at Southern Oregon University in Ashland, where he has served as a dean and as interim provost. 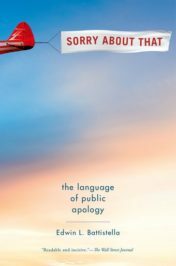 He is the author of Sorry About That: The Language of Public Apology, as well as Do You Make These Mistakes in English?, Bad Language, and The Logic of Markedness. That is an excellent article. As a High 🏫 dropout I was developing an aspiration for writing. At age 65 I haven’t made any notable progress as a writer. However, I’m gaining still in “baby steps”. My writing is relegated to social media and not very self satisfying, but that doesn’t hinder me. I feel fortunate to have access to these highly educational articles. And I thank you for such.